This recording is almost certainly the first performance of Mozart’s original setting of Bastien und Bastienne since its original (and only) performance at the home of the person who commissioned it 250 years ago in 1768 – Dr Franz Mesmer, of mesmerism fame. The opening Grabmusik is also given in its original 1767 form, lacking a final recitative and chorus added in the 1770s. Both works are examples of Classical Opera and The Mozartists pioneering Mozart 250 project which, between 2015 and 2041, will explore the music that was written by Mozart and his contemporaries exactly 250 years earlier. 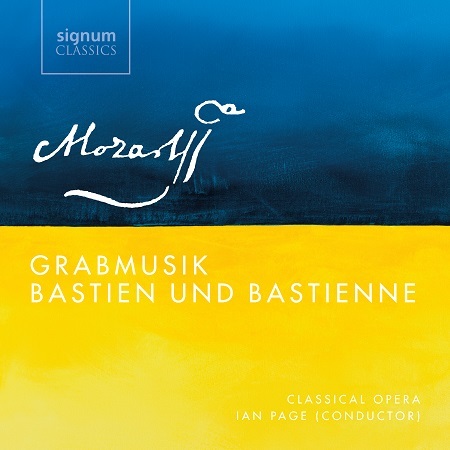 Grabmusik & Bastien und Bastienne represent the years 1767/8, when Mozart was 11/12 years old. The opening Grabmusik lasts about 18 minutes. It is based on a Holy Week tradition of performing a sepolcro cantata focussed on Christ’s grave and is in the form of a dialogue between a lamenting soul and an angel. It was probably first performed on Good Friday 1767 in Salzburg Cathedral. It is piece usually attached to the story that the Prince Archbishop of Salzburg, not believing that the 11-year old Mozart could write advanced music, locked him up for a week with only music paper, Grabmusik being the result. It opens with a dramatic Aria for Die Seele (The Soul: Jacques Imbrailo) followed by a gentle response from Der Engel (The Angel: Anna Lucia Richter) before the two combine in a concluding duet. The principal work is Bastien und Bastienne, the autograph score of which was rediscovered in Poland in the 1980s. it is in the form of a single act Singspiel which, like the Magic Flute, combines spoken text with the operatic elements. The plot is straightforward. Bastien and Bastienne are pastoral lovers. The shepherdess, Bastienne, is concerned about Bastien’s roving eye, and takes advice from Colas, a fortune-teller and magician. He advises Bastienne to spurn Bastien and hints that she has a new lover. This causes Bastien to also seek advice from Colas. Colas concocts a magic potion (during an aria of nonsense words Tatzel, Brätzel, Schober, Kober, Indig, Windig, Kuffer, Puffer) which he announces has solved all their problems. However, Bastienne decides to carry her game on, to the point when Bastien contemplates suicide. The lovers eventually reunite and join ins singing Colas’s praises. Musically it is also delightfully straightforward, with a succession of tiny arias, most lasting less than two minutes, and all little gems of their kind. Mozart combines elements of French and German music in his score. Anna Lucia Richter swaps her earlier The Angel for the role of Bastienne and is joined by Alessandro Fisher as Bastien and Darren Jeffery as Colas. Both in terms of singing and orchestral playing, the performances are emotionally compelling and technically excellent. Ian Page clearly has Mozart in his heart and seems to channel the young Mozart’s musical enthusiasm in his direction. An appendix repeats Colas’s nonsense aria with the different words from a 1769 Salzburg performance, giving us Diggi, daggi, Schurry, Murry, Horum, Harum, Lirum/Larum’, in place of Tatzel, Brätze. The CDs liner notes can be found here. They include translations of the libretto into French, English and Italian alongside the original German.